Mysterious Scrolls Game: For almost as long as we’ve had civilization, we’ve lost it. There are records going back hundreds of years of explorers discovering huge temples encrusted with jungle. Or giant pits full of treasure that were once grand palaces. Why did people abandon these once-thriving cities, agricultural centers, and trade routes? Often, the answer is unknown. The Maya Empire, centered in the tropical lowlands of what is now Guatemala. It reached the peak of its power and influence around the sixth century A.D. Ancient scrolls hold secrets to the Mayan civilization’s mysterious collapse. More over, these scrolls recorded ancient Mayan medicines, astrology and the secrets of eternal life. 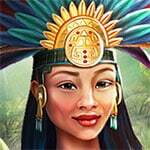 Itzel is a girl who is a direct descendant of the ancient civilization. She went to explore the sacred Mayan castle. Where she hopes s to find the secret and mysterious scrolls of her ancestors. But, along the way she is faced with a lot of puzzles. So Itzel must think carefully before answering if she wants to find the scrolls. Enjoy and have fun.